U.K.-based green energy company Ecotricity is taking Tesla to court claiming the electric automaker stole charging locations and broke an NDA in what the company's founder describes as a "smash and grab raid" on its intellectual property. Ecotricity says Tesla approached them last year to help plan its Supercharger network in the U.K. It's a solid choice, since the company is the oldest and most established green energy supplier in the country, with over 100 quick-charging stations dotted around the U.K. 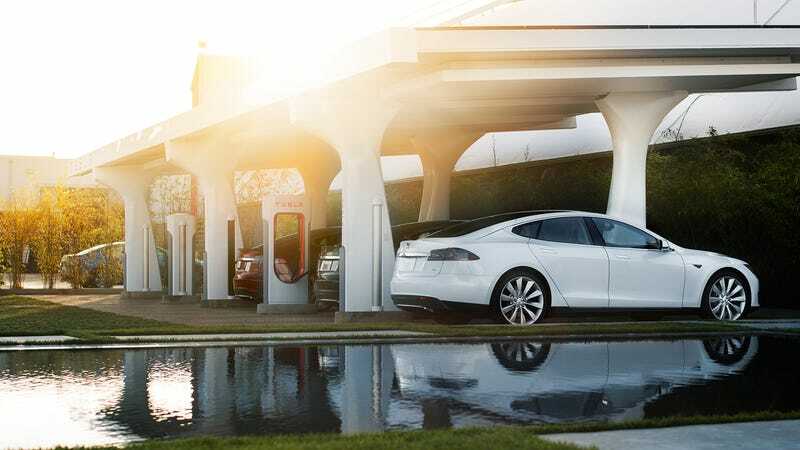 But after meeting with land and station owners, Ecotricity claims Tesla went directly to the company's partners to begin installing Superchargers, cutting out the middle man in the process. After signing a mutual Non-Disclosure Agreement, Ecotricity helped to design Tesla's network, showed them the best locations, introduced them to our landlords and partners, and started building the first two chargers for them ready for the launch when Elon comes to town, on the 7th of June. Soon afterwards, Tesla released the location of its first four Supercharger stations and according to Vince, "all of them [were] our locations." Ecotricity also claims an email it received from Tesla was "shocking and brutal", although after numerous inquiries the company refuses to release them. "[The email] set out what Tesla were going to do to Ecotricity this week in talks with Government, our partners and the media, says Vince. "It was very dark." Naturally, Tesla's U.K. arm can't comment, only saying that, "We are aware of the actions taken by Ecotricity, but cannot discuss a pending legal matter any further." The Chancery Division of the High Court in London has filed a court date for June 4 to review the injunction papers, but right now the only thing Ecotricity can claim is that Tesla had broken an NDA. "We are shocked and disappointed that a company like Tesla, with it's aura of new world technology and challenger brand status – could behave in such an old world way – shame on them and shame on Elon Musk," Vince said.